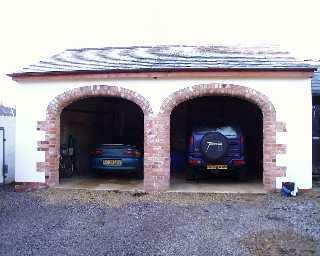 Two of the outbuildings were converted into garages with arches in the style of Northamptonshire barns. 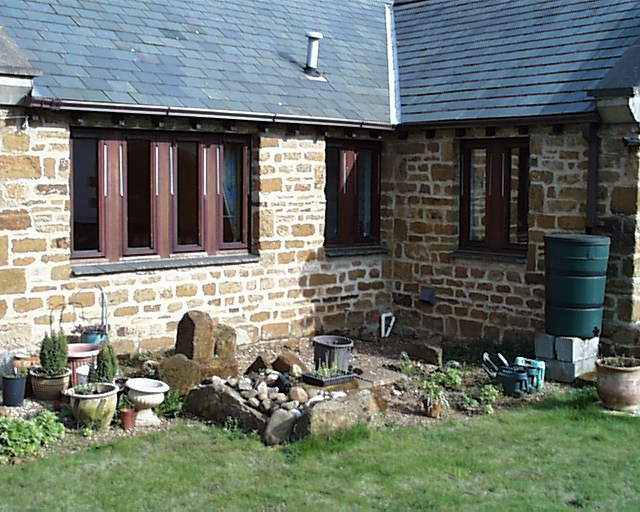 The building work was undertaken by Boyson Construction who built extensions on our previous houses. 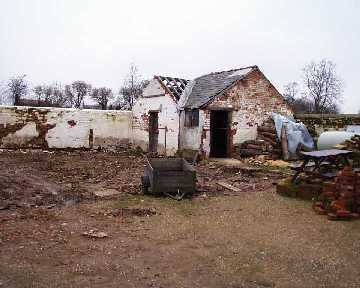 The back barns, once the home of pigs, were demolished. We had the help of a local farmer who came in with a digger and removed the concrete in readiness for top soil being spread in readiness for laying the turf. This end wall was built out of stone and mud. It may have been 400 years old but we had to demolish it because it was not safe. We had to get a skip in to remove the mound of rubble this produced. 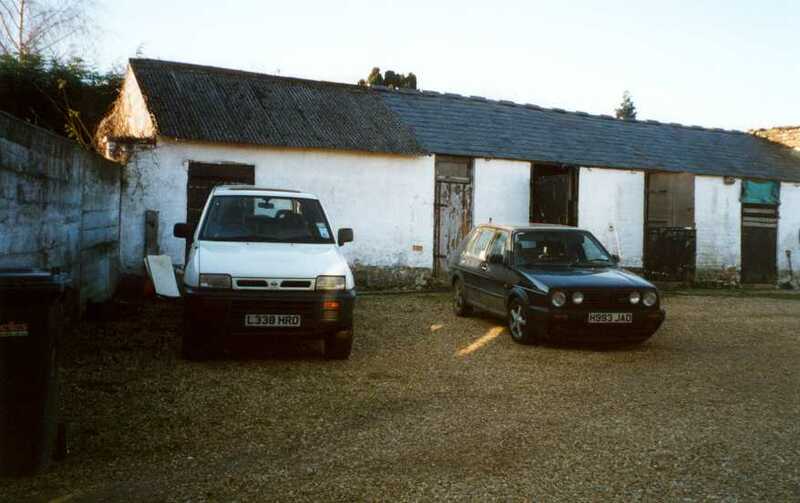 One year on from the demolition of the end barn we had the barns rendered and in April 2001 we painted them white. The change between the picture left and this is very dramatic and reminds us of the improvements we continue to make. 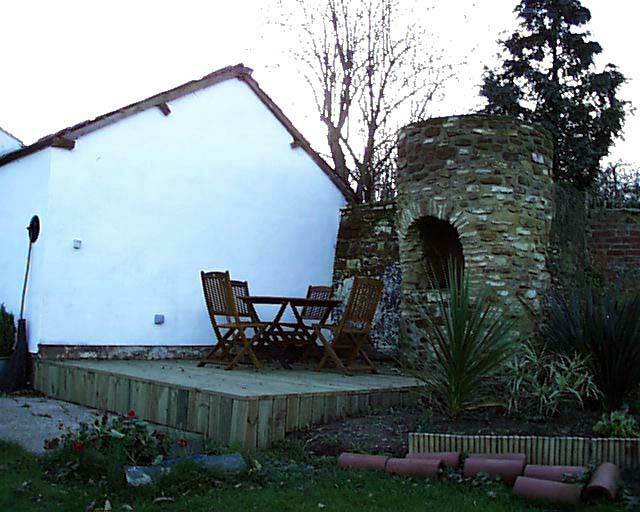 The roof and end wall were removed and Jane built a stone tower which includes a barbecue. Steve needs to design and build a conical roof with a hole to act as a chimney. This caused him significant issues and he managed to delay the building process for a number of years. The front gates were designed in Autumn 1999 and installed in January 2000. They have been admired by many villagers. The gates were eventually automated in Spring 2001 which added to the security of the house as well as saving us from getting out of the cars when we arrive home late at night in the pouring rain. 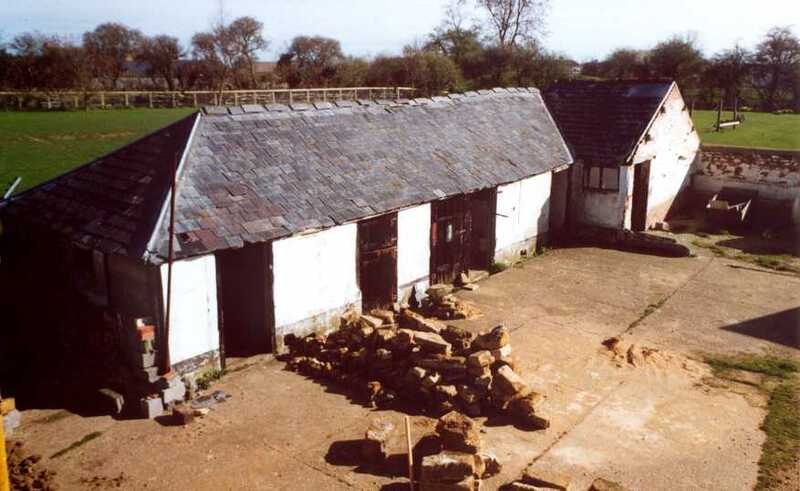 The view from the corner barn in 1999. The shape of the out buildings continues to improve. This corner of the garden which is bordered by the guest bedroom and the summer room is ideal for a patio. 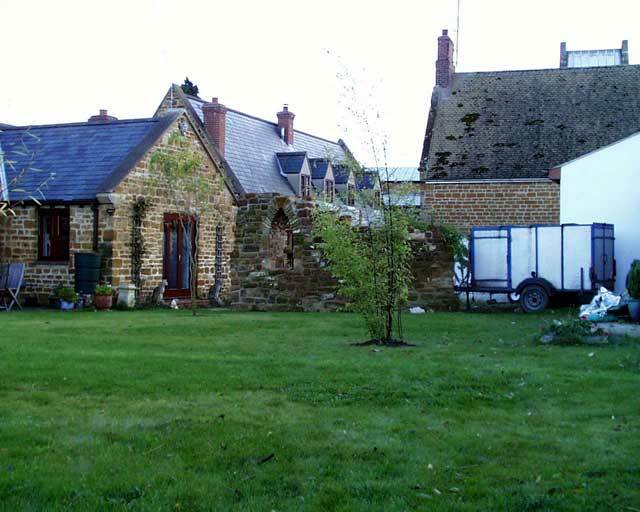 We started to clear the ground in April 2001 but this was very hard going because it was full of rubble and thick clay. 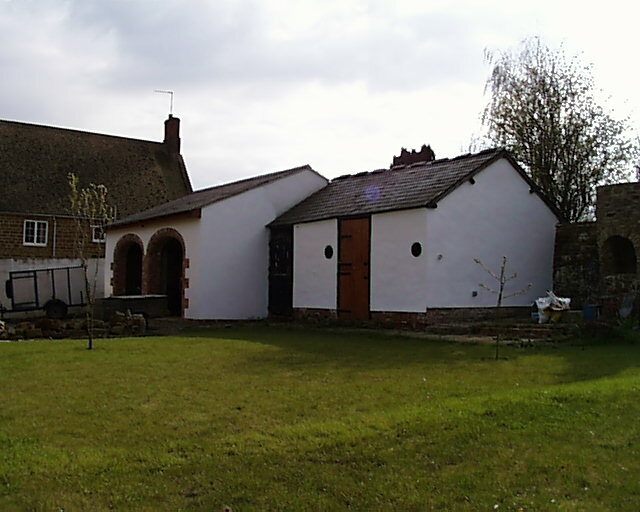 By August 2001 the patio had been completed with the aid of a proper landscape gardener. 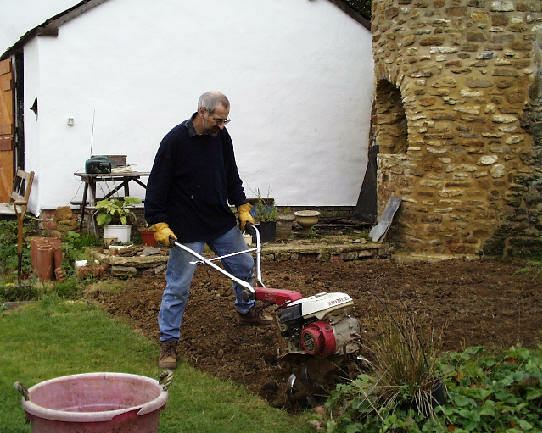 Steve has become a dab hand at using numerous labour saving devices and a rotavator is just another one of these. He managed to turn over this plot in an afternoon, it would've taken several days if we'd tried to hand dig it. This area is now our grasses garden with bamboo and tiger grasses. 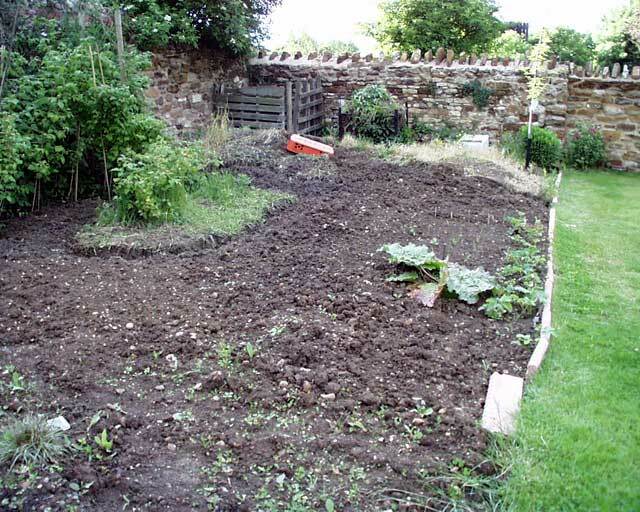 When we first moved into the house we started a vegetable plot by rotovating this whole area. 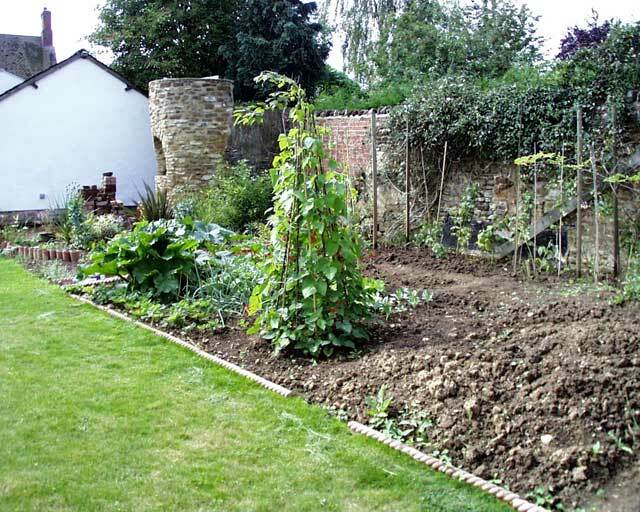 We then concentrated on the rest of the garden and decorating the house so the veggie plot became overgrown with weeds and a sprawling strawberry bed. We hand dug the soil to get rid of the worst of the weeds and then Jane planted out some crops during the spring of 2001. The results on the right are just beginning to show through. 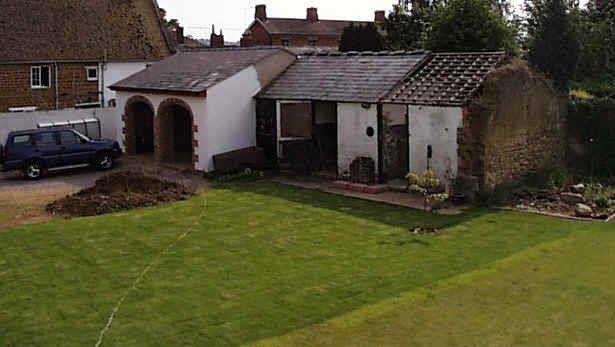 In the Autumn of 2000 we laid the foundations for what was going to be a ruined wall in the style of an old monastery. 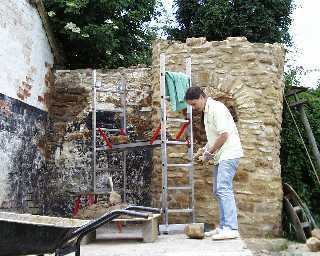 The stone wall started to take shape at the hands of master mason Jane. 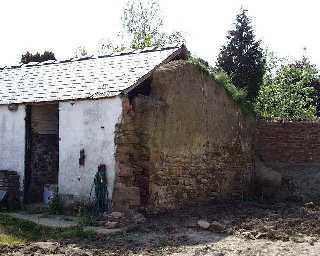 We have plenty of stone left over from the demolition of barns and walls so the material wasn't going to be a problem. The idea is to put a gothic window in the wall and eventually Jane will create a stained glass window in the wall. It was always our intention to have some decking in the garden and Steve procrastinated for as long as he could worrying about the design and construction. Eventually he plucked up the courage, bought the wood and started to set out the timber frame. Jane built the brick piers upon which it was placed. The finished article is very pleasing. The decking is complete and has garden furniture to add the finishing touch. 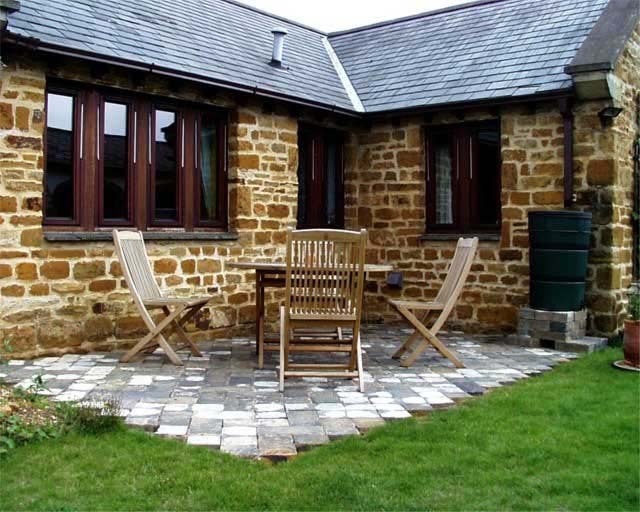 We even had good enough weather in October 2002 to have afternoon tea and biscuits out on the decking. We will be adding a small wet area amongst the grasses with bubbling water to add to the peacefulness of this corner of the garden. 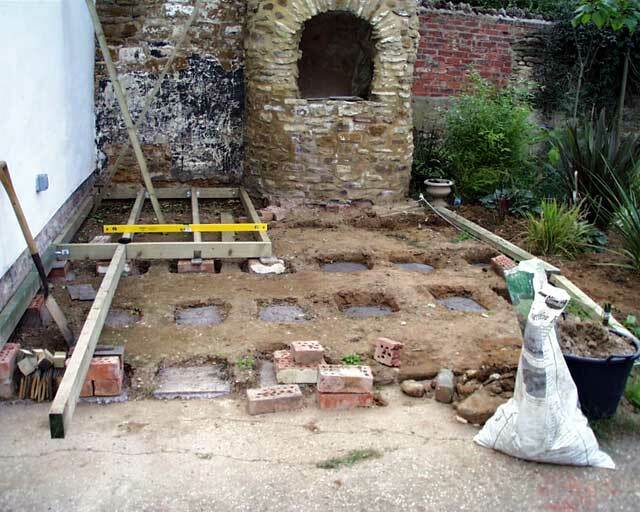 By May 2004 our garden is becoming more mature and it's losing the look of a building site although there are still one or two corners that require considerable work before they are complete. 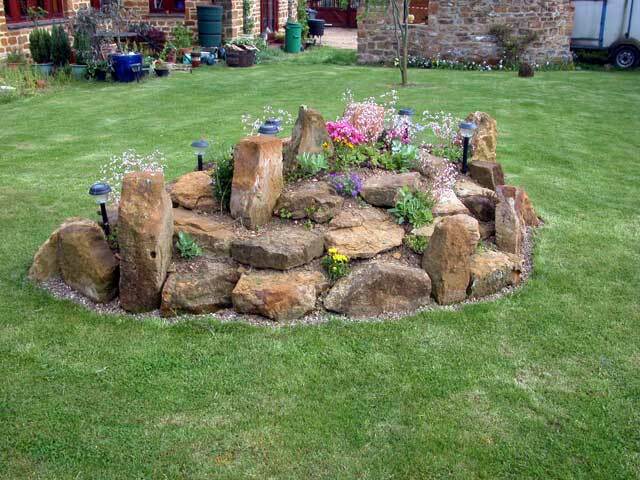 The rockery that was created last summer out of the spoil from the pond, is now colourful having been planted with alpines and heathers. The London Pride donated by Deirdre, our neighbour, has done particularly well. 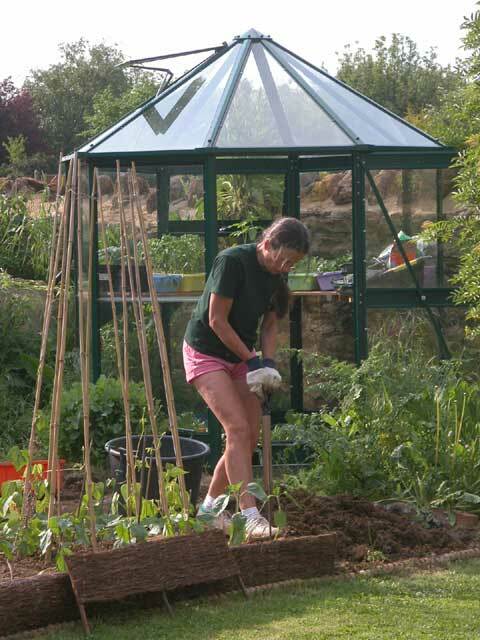 The octagonal greenhouse has been Jane's pride and joy since we erected it last summer. 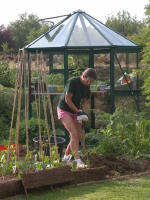 She has spent many hours this spring sowing seeds, potting on plants and then planting them out into the vegetable plot. 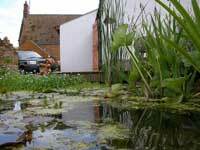 June 2005 - The pond is maturing but we have a serious problem with blanket weed that is clogging the whole pond. The frogs, newts and fish don't seem to mind because it gives plenty of cover from preying Herons. In previous months we've had problems with the stream leaking somewhere and the water level in the pond falls dramatically but we've found the cause of the problem and the stream is now running constantly without great loss of water - other than evaporation.